I read in the newspaper that it is only 12 weeks until Christmas and while I realise you shouldn’t believe everything you read in media, unfortunately I think this one might be true. I don’t know where September has gone. Perhaps it washed away in all the rain – our driveway was underwater for a couple of days and the chickens had fun splashing around in the puddles. On the subject of chickens – they have a perfectly good chook house down in the orchard. A perfectly warm and dry place for rainy days. Instead, my girls took refuge under our camping trailer and each time I opened the kitchen door, they’d do a mad dash through the rain and up on to the deck just in case I was tossing out some delectable morsel for them to eat (never-mind the Chookateria full of pellets in the warm & dry chook house). So September passed in a blur of rain and a quick MRI-related trip up to Auckland which involved me & Mopp having great fun exploring the back alleys of Newmarket. 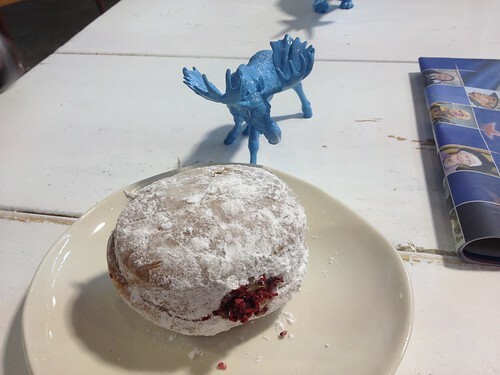 We visited some very awesome shops – including Little & Friday where I had a Raspberry & Custard Doughnut. Mopp wasn’t allowed to eat before his scan so I didn’t eat either so I could feel his pain (actually, I’m not great at eating first thing in the morning and he knows that so I can’t pull the wool over his eyes). The first thing we did after the medical stuff was done was to find some food. 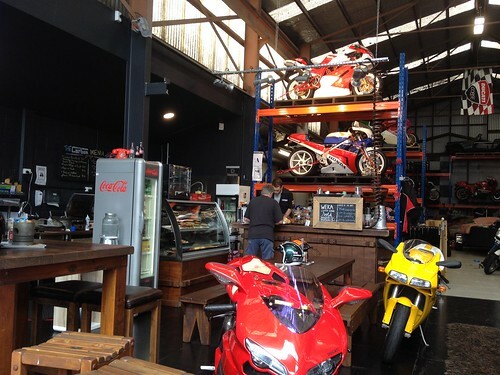 I knew L&F was in New Market but I hadn’t found exactly whereabouts and just as well I hadn’t done my homework too well, as in our getting lost we found a very cool Motorbike shop (with a café), an extra very cool shop full of extra cool food stuff and a few other interesting little places. Obviously we found L&F too – I was a little worried about the communal tables as both Mopp & I aren’t great in social situations but we managed to survive on a little bitty corner and soon forgot that we were sitting around a table with a bunch of complete strangers. 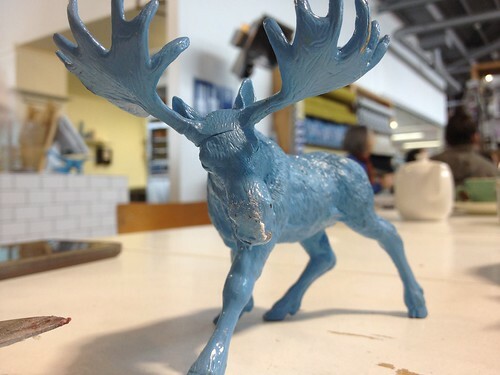 Mopp also forgot he wasn’t in Gizzy and was soon playing with the bright blue “table marker” animals. 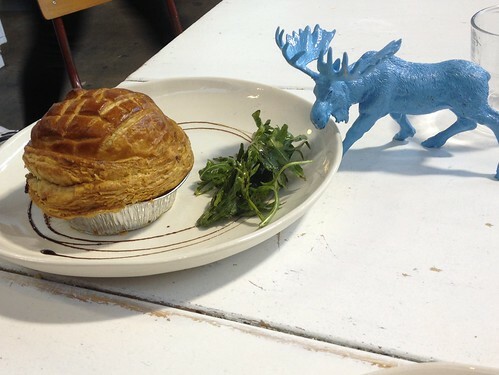 Our moose had a fight with a rhino then attacked my doughnut ending up with a very powdery nose. I spend ages browsing through Wise Cicada – they have all sorts of interesting ingredients. I wanted to buy lots and lots but I managed to curtail my purchasing to a bag of sorghum grains, some vegetarian rennet, the new coffee-flavoured Whittakers milk and some Mad Millie stuff to help out with our milk kefir, water kefir and kombucha production line. We could have eaten at the Wise Cicada in-store café – that is on the list for my next Auckland visit (they have kombucha on-tap!). 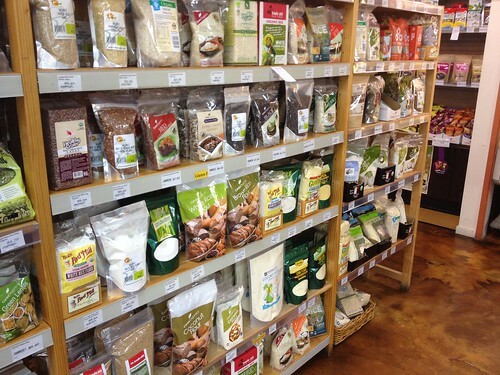 I also found a similar shop in Frankton, Hamilton: Village Organics where I managed to pick up some New Zealand-made fish sauce that I had found on-line but hadn’t quite managed to order as yet. I think I made a few more purchases there but it’s all a bit hazy now (school holidays last week made fuzz of my brain). 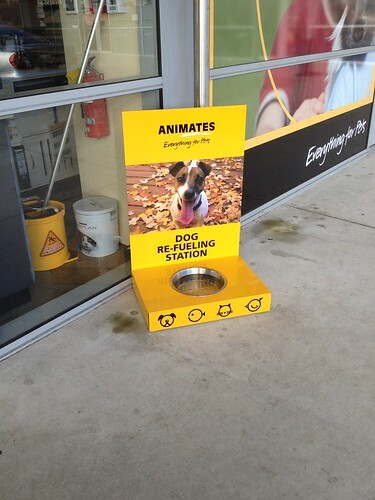 Auckland is a superb place for shopping…… we visited every pet shop that we could find. Mopp decided he wanted a tiny Chinchilla, a parrot, a turtle and a……. can’t remember as I paying attention after the first one. The Mopp had fun patting all the dogs visiting the in-store vet clinic as well as talking to the parrot pooping on the veterinary nurse’s shoulder. We squeezed all the squeaky dog toys trying to find the perfect Holden present. We spent a stupid amount of time trying to decide which flavour cat treat to buy for our peculiar little black cat, Butterglee. 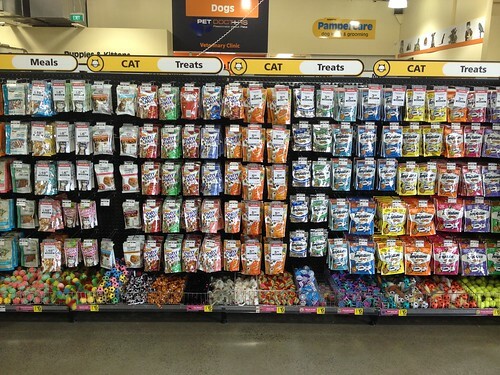 We can buy cat treats in Gisborne but not it all these flavours….. I did consider buying a present for all the pets but with 2 dogs, 5 cats, 2 cockatiels and 5 chickens, it was a very real possibility we spent the next 3 days in the pet store trying to decide what to buy (not that 3 days in a pet store is a trial or tragedy but The Anster was expecting us home the following day). There are no apples in this post. Usually a trip to Auckland or any other city outside of Gisborne entails shopping up a storm and buying lots of cool and exciting apple stuff. However, a recent trip to Auckland this past July, took care of the apple needs and my apple product basket is still full overflowing. Our kitchen has been a whirl of kombucha, kefir (both milk & yoghurt), sourdough and sour cream production. I have now got interesting in sprouted grains so currently have a bowl of quinoa and barley in the process of sprouting. But now, I need to get off my computer and back into the kitchen to make muesli and bread for the ever-hungry offspring. This entry was posted in Gisborne Life and tagged Little & Friday, Village Organics, Wise Cicada by Jo Dohrman. Bookmark the permalink.